Put rawa in a kadai and dry fry it till hot to touch. Same kadai put the dhal and fry slightly. Bring two cups of water and 1/2 cup of milk to boil. Add chopped ginger and salt to the boiling water. When it starts boiling, reduce the heat and add the rawa slowly and stir well. When rawa is cooked well and form a lump, add the cooked dhal mashed well. Add one or two teaspoon ghee/oil and mix it nicely. In a kadai put the remaining oil/Ghee and when it is hot, add Almond, asafotida powder, curry leaves and coarsely powdered pepper and jeera and fry just for a second. 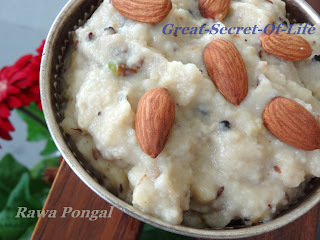 Add this seasoning to the rawa-dhal mixture and mix well. 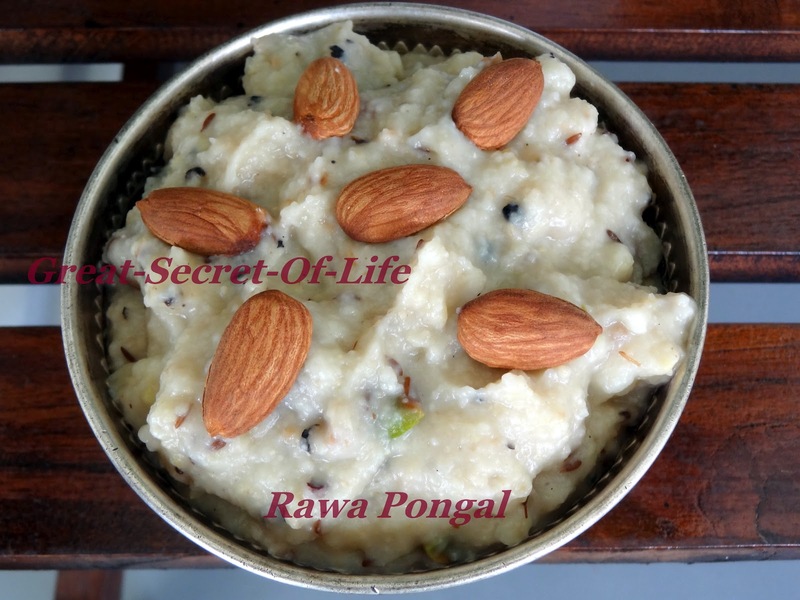 Rava pongal is a Traditional breakfast recipe. I love to eat it. it can be easily Digest and quick to make. it is the best diet food.